Notes: PRR Class LS-25; Horseshoe Curve; Altoona, PA. 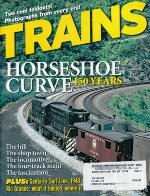 Description: Here is the front cover of a 24-page cover article entitled "Horseshoe Curve: 150 Years." It was published originally on the August 2004 issue of "Trains" magazine. Photo Caption: "A Lima T-2500 transfer unit helps a westbound on Horseshoe Curve, 1951. Photo by Thomas J. McNamara." Shown here is Pennsylvania Railroad engine #5681, an LS-25 built by Lima-Hamilton in 1950 and rated at 2,500 horsepower. Also visible is PRR N-8 caboose #478202.